I’ve owned a few nice Gretsches including a Setzer SSLVO, a Setzer Hot Rod, and a Gretsch Billy Bo, as well as a couple of Gretsch Electromatics. I’ve also owned two Guild X170s, a pile of Guild Starfires, both of the III and IV variety, and too many other guitars to count. 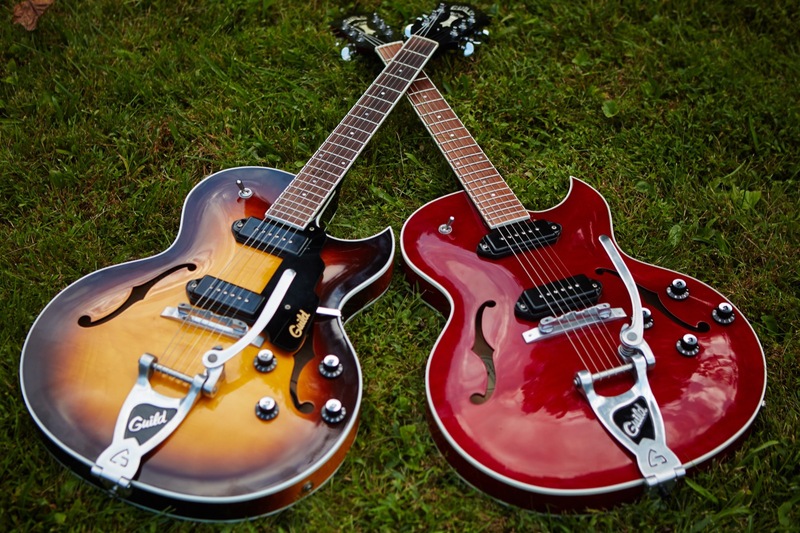 I have a thing for hollow-body guitars with a Bigsby, or as we in the Guild world call them when they say Guild on them, a Guildsby. After seeing this video put out by Guild, I decided that I had to have one of these Newark Street X-175B marvels. I finally got my hands on one for a great price and was thrilled when I played it. Let’s find out why this guitar excites me. This guitar, like all the Guild Newark Street models, is finished with polyurethane (poly). It must not be very thick because I had to look it up to see if it might be Nitro. It doesn’t feel like its encased in a plastic shell, so I’d say the finish must be thin enough to work well. Kudos to Guild for that. This guitar has actually faded nicely from its original blonde color, which is one of the reasons I wondered if it was nitro. The neck is perfectly straight, like all Guilds I’ve owned. The neck shape is very comfortable without being too thick or too thin, leaning on the thinner side when compared to my Starfire III-P90s. The rosewood fretboard seems to be of the normal quality in a quitar of this price range, and the fret markers are nice enough to look good on stage, though up close they show rough edges which is also typical of guitars in this price range. This is really being nit-picky, though, because I can’t feel those edges so it’s not something that bothers me at all while I’m playing (I have guitars with terrible inlays that do bug me while playing). Certainly people in the audience will never see that level of detail. 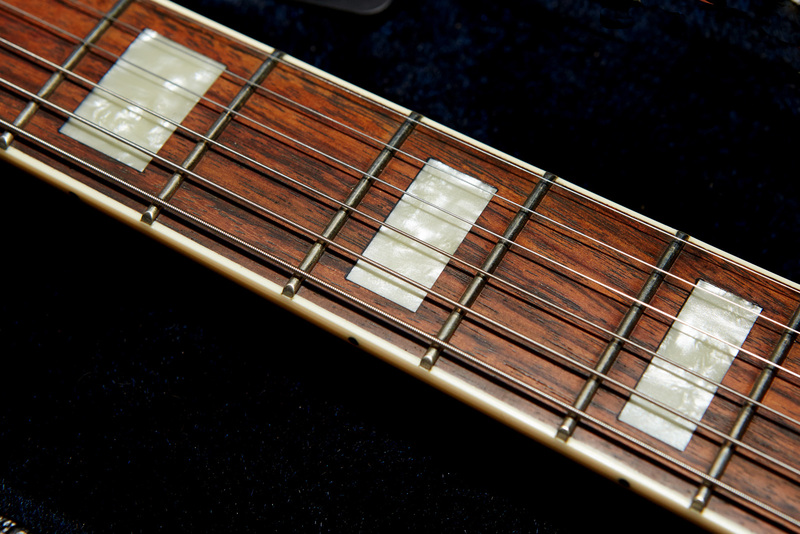 To counter my needless complaint about the inlays, take a look at those fret ends. They’re supurb! The guitar is very well made with no visible flaws or poor craftsmanship. This is not a $5000 custom instrument, and I don’t expect it to be, but for the $500 I paid (used), I honestly didn’t expect this level of quality. About the only thing that catches my eye on these Newark Street models is the less-than-perfect edges around the inlays which I’ve already covered. The guitar weighs a scant 6 lbs 13 oz and feels similar in the hand to other similar guitars I’ve played. Comparing it to my Westerly X-170T, this guitar is lighter and more lively, likely due to there being a sound post in the X170T while the X-175B has dual braces on the top. Since those braces do not connect to the back of the guitar, the guitar feels more alive. The pickups are reproductions of the Franz single coil pickups found on the original Guild X-175. I have no experience with original Franz pickups, but I have plenty of experience with modern P90s, having had a Gibson SG with them, as well as two Guild Starfire IIIs, both of which were made in the Guild Corona factory in 2002. Both of those Starfires are full hollow-bodies, but they’re thinner than this deeper-bodied X175B. P90 pickups are also known for their rockin’ midrange and their wonderful growl in a distorted tube amp. This guitar is much brighter than the Starfires, which I attribute to the pickups. In fact, with the tone knobs on 10, and the bridge pickup dimed, the guitar can actually get a bit shrill. I come from the school of “put everything on 10”, but on this guitar, dialing back the tone a notch really makes it shine. My favorite position on a guitar like this is with both pickups engaged (middle switch position), and this guitar is no exception. With both pickups on and the tone dialed back to 8 or 9 on the bridge pickup, this guitar comes into its own. Though I’ve read concerns that the bridge pickup is not in the right place according to its vintage namesake, thus causing the middle position to be less than ideal, my only observation is that the middle position is a bit harsh which is why I recommend dialing back the tone. After fiddling with the guitar for some time, I dialed in some different amps on my Axe-FX, and that’s when I discovered that this guitar is VERY amp-dependent. What sounds shrill and almost painful on my ’63 Bassman patch sounds divine on the “Tiny Tweed” setting. In fact, with the new amp setting I went back to diming all the tone knobs on the guitar, which is how all the sound samples in this article were recorded. It’s difficult to examine the electronics in a hollow-body or semi-hollow guitar since it’s all contained within the body and there are usually no access panels to let you in. Luckily Apple has provided a camera on the end of my phone that’s long and thin and fits within the F-holes of such a guitar. Similar to the Guild S-100 I reviewed, I think it’s fair to assume that the electronics are made in Korea and as we can see in the pic, a similar wiring technique is used right down to the non-shrunk shrink wrap. I wonder if this is just a means to keep the wires together and not vibrating, though the other wire bundle is held together with a wire-tie, so who know what they were thinking? The addition of quick-release connectors is nice on a guitar like this since it’s so difficult to swap pickups without an access panel, but looking at the electronics, it strikes me that I wouldn’t be able to get my arm in there so I’d have to pull the pots to access the quick-release connectors anyway. At least there wouldn’t be any soldering required. 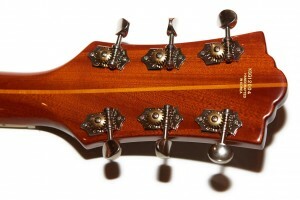 As I wrote in my review of the Newark Street S-100, I don’t like the tuners on these guitars. They work OK, but they’re not as tight or as smooth as the nicer tuners that Guild used to use on its American-made models. Also the tuning pegs themselves are a bit small for my hands, though that’s not really a big deal. Again, though, for the money I spent on this guitar it’s not fair to complain since they function and look fine. This guitar has the same ugly yellow switch tip as the other Newark Street guitars, though I imagine putting a metal switch tip on at the factory would raise the price. You know, about a dollar. The frets are perfect with no rough spots, and no flaws that I could find. 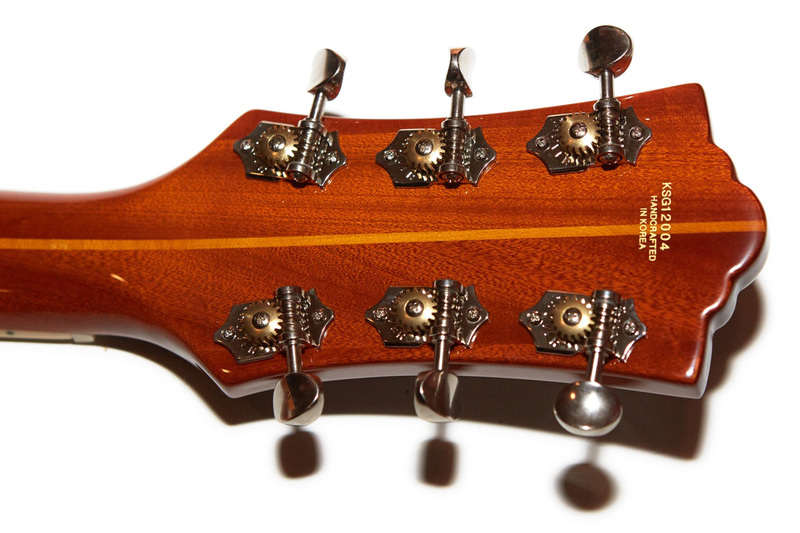 The ends were all very nicely rounded and the guitar plays like a dream. The Guildsby operates as it should, and feels just like the ones I have on my Starfire IIIs. The nut is bone and seems to tolerate the Guildsby without concern. The bridge is an infernal tune-o-matic type, and I will likely replace it with something from Compton, which I’ve done on almost every similar guitar I’ve owned, though to be fair it seems to perform fine as-is. As I wrote in the pickups section, this is a much brighter guitar than one equipped with P90s. For the type of music I’d play with this guitar, the tone I’d chase is what I’d describe as chimey. Gretsch TV Jones Filtertrons get that sound. 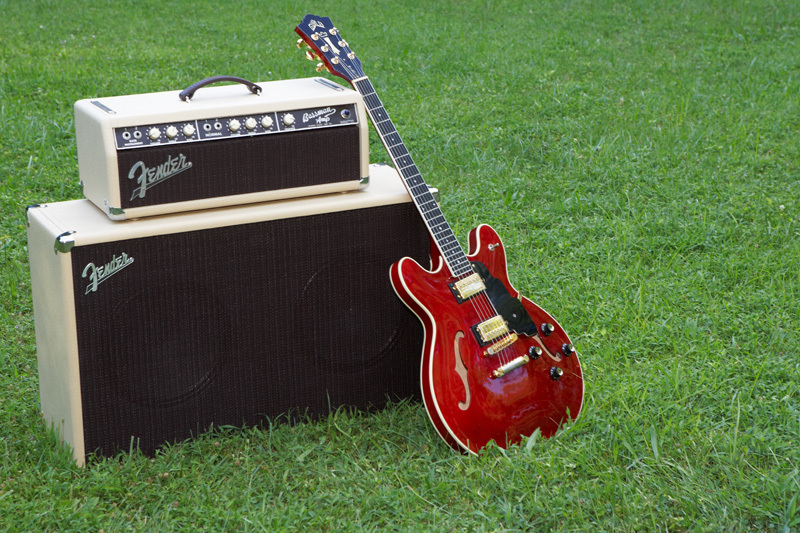 P90s can get that sound, but they’re also fatter-sounding, with more midrange. Tone is affected a great deal by the amp and speaker being used, and if I still had it, I’d be blasting this thing through my old ’63 Bassman. I no longer have it, though, so I had to use my Axe-FX Ultra with a pretty good simulation. By the way, the Bassman is shown with my 1994 Starfire IV which I also no longer have. Because I’m an idiot. My Bassman patch was made in order to make my Gretsch SSLVO sound right with it, which it did. 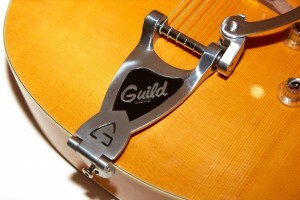 The problem is that the patch sounded truly awful with the Guild X-175B! The best way to describe the sound is shrill. It was seriously not good. It was so bad that I didn’t even record it because the patch is custom and thus it would be unfair to judge the guitar on a patch no one else would be using. As soon as I changed to a “Tiny Tweed” setting, though, the guitar really opened up. With the bridge pickup on, digging into the strings gives a satisfying bit of growl in all the right places. Attempting to play Brian Setzer’s ’49 Mercury Blues rewarded me with a nice rockin’ sound with just the twang I was looking for. On the neck pickup, I got some nice jazzy tones where I could do my best with Setzer’s version of Sleepwalk, which is one of my favorite songs. I can even almost play it! With both pickups on I went for the intro to Stray Cat Strut, further proving that I need more time on the frets before I hit any stages. Fooling around some more with the neck pickup, I liked the tone, but the bass side of things got a little “woofy” from time to time leading to the conclusion that the guitar does pretty well, but it seems to struggle at the extremes. With the bridge pickup volume and tone on 10, the guitar can sound shrill with a brittle ear-piercing tone. Dial the tone back even to nine and it cleans up nicely. 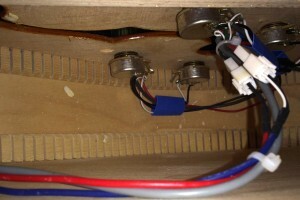 This is evident with both pickups on as well, but again, this can be very amp dependent. On the bass side of things, playing on the first few frets of the low E string, the guitar seemed to lose a bit of clarity. Dialing down the tone doesn’t help here because all that does is roll off more highs. Still, my complaints are not deal-breakers. Remember, this is potentially a $500 guitar on the used market, and for that price, my concerns are almost nit-picky to the extreme. If I had a guitar like this when I was 15, I would have been in tone heaven. We just didn’t have quality low-priced guitars like this back in the ’70s. 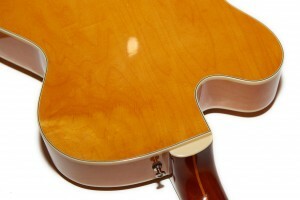 Guild calls the neck shape on this guitar a “soft U”, and that seems pretty accurate. It’s not too thick, and not too thin. As much as I loved my Gretsch SSLVO, the V-neck bugged me. I like the neck on the X-175B much better, but I don’t like it as much as, say, my 2002 Corona Guild Starfire III-P90. With its smooth frets I never once felt a snag. The fretboard feels great, the Guildsby is smooth and works properly, and it stays in tune as well as any vibrato tailpiece-equipped guitar can without locking tuners. While it doesn’t have the attention to detail in places like the fretboard inlays, and it can be a bit shrill with the wrong amp, when it comes to playability, and most importantly feel, this guitar blows away any similarly priced guitar that I’ve ever played. I like the tone, too, but you may need to tweak it a bit to take depending on your amp. 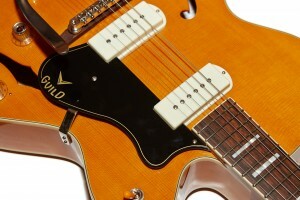 To me, the X-175B makes a Gretsch Electromatic feel like a lifeless block of wood. If I had to compare it to any of the guitars I’ve owned, I’d have to say it most closely feels like my Gretsch SSLVO, mostly because of how lively it feels. I payed $2000 for that guitar used, while this X175B cost me a FOURTH that much. It doesn’t have the same attention to detail, doesn’t have the same sound, and is clearly not meant to be a competitor for such a guitar in any way, but you know what? If I was forced into this being my only guitar, I would not be troubled at all. Hi, great review. 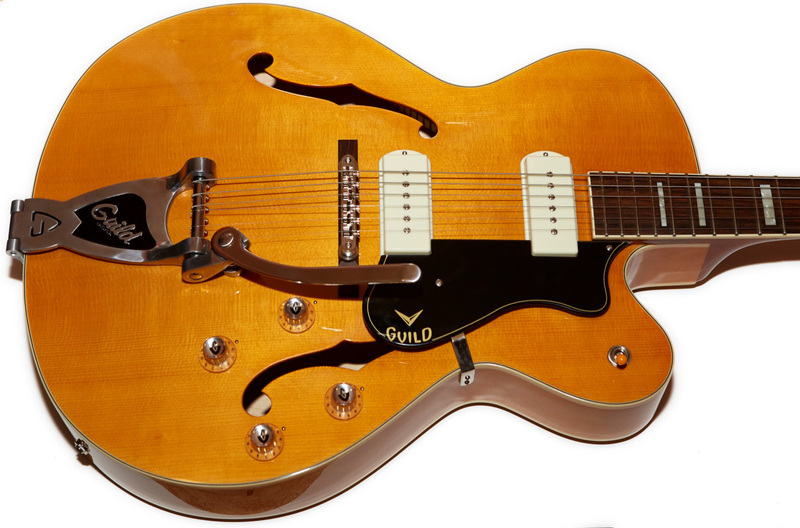 So this Guild is better quality than a g5420t? 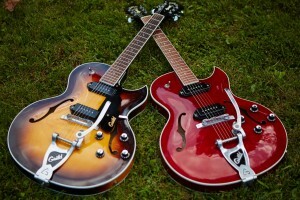 I wanna buy one of these guitars, don’t know which one should I get, my head is gonna explode lol. The bridge is pinned on this x-175b?